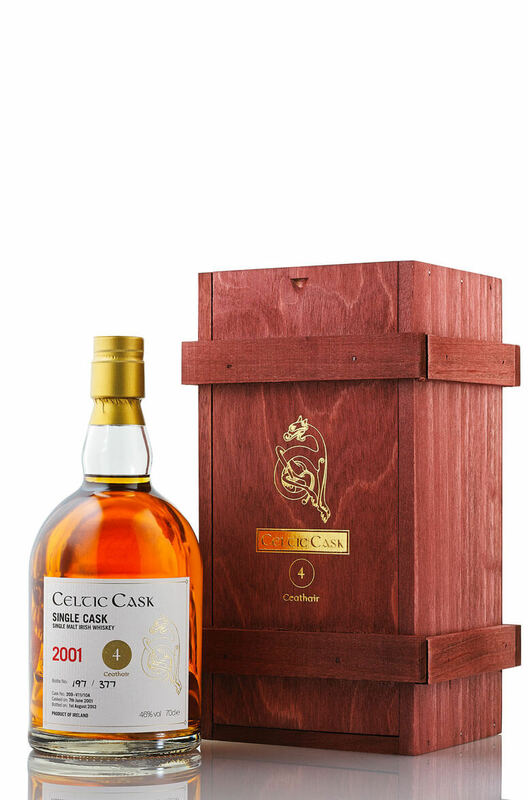 Celtic Cask “Ceathair” was matured in 1st fill Bourbon casks for 10 years. In December 2011 it was emptied into a Madeira cask from Vinhos Barbeito – A producer of exceptional quality Madeira. It was bottled at just over 12 years old. This whiskey was distilled at Cooley Distillery, Co. Louth. It is unchill-filtered with no added colouring. Drawn from cask number 209-V11/10A. Just 377 bottles made. We love the rich, Madeira character which works really well with the maltiness of the Cooley malt. One to take your time over! Nose Highly complex aromas of beeswax, lemon, baked apples, fruit bread,and toffee with some spicy nuances of nutmeg and cinnamon. Palate Initially quite dry on the palate then a wave of citrus, melon and tropicalfruit flavours hits you. Highly complex fruit flavours including white grapes,ripe galia melon, sultanas, figs and lychees. Finish The finish is more warming and spicy with some ginger and cinnamon spice along with some lip smacking tropical fruit.